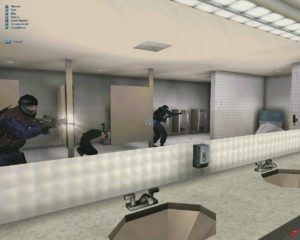 Rainbow Six was released back in 1998, and essentially spearheaded the modern tactical shooter. Authentic military equipment was featured, you were given command over multiple AI teams, and both friend and foe would fall to just one or two shots. If Rainbow had a fault, however, it was in its elaborate mission planning, which used waypoints to smooth over its rather primitive squad AI. I think most everyone hit a point where they just abandoned the planning stage altogether to do their own thing, hoping that the tagalong AI would react to threats and/or stay out of the way. At the end of the day, it’s all about bringing the hostages home safe. Meanwhile, Sierra’s Police Quest/SWAT franchise wasn’t in a great place. The first SWAT crossover disappointed, and SWAT 2 was overly clunky and complex. The popularity of Rainbow Six must have given someone at Sierra an idea though, and rather than be a simple clone, SWAT 3 was designed around “on the fly” management of your AI team. True to the namesake teams, you were responding to threats in minutes and with little information, and had no time or ability to pre-plan with waypoints and the like. The results are still somewhat shaky, and sometimes frustrating, but it’s much more dynamic than Rainbow, and the first of the SWAT series that starts to feel right. 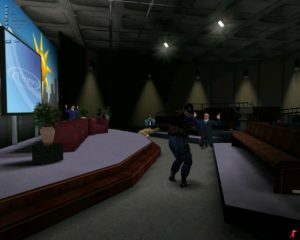 SWAT 3 takes place across seven days in Los Angeles, around the signing of a global de-nuclearization treaty, WTO conferences, and the commemoration of the first World Peace Day. Leaders from nations around the world are attending, and the combination paints an almost comical bulls-eye on the city that, roughly, every terrorist organization in the game’s fiction simply can’t resist. 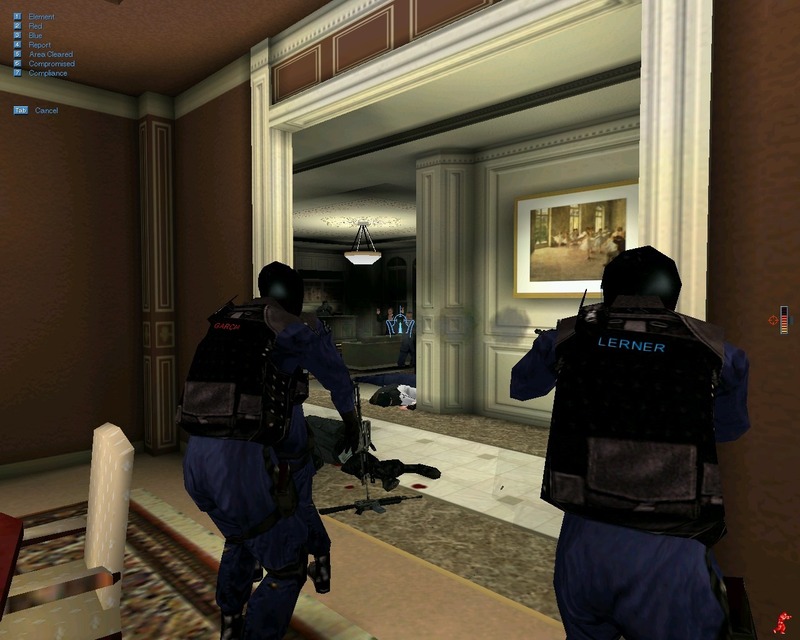 The initial barricaded suspect and high risk warrant missions soon lead to increasingly elaborate schemes against progressively difficult organizations, with the numbers of enemies, hostages, and rooms to clear scaling significantly as the game goes on. Every mission starts with a briefing. The call from dispatch is played, along with a spoken overview from your commander. A further series of incident timelines, witness statements, and physical descriptions of suspects (if available) can be tabbed through, but these are almost always just extra color. 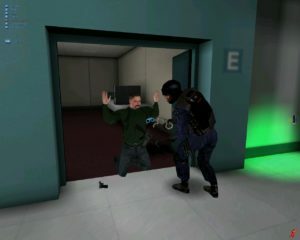 Your reactions to anyone within the game will be based on their behavior, and you’ll never need to, for example, use this information to spot a terrorist pretending to be a hostage. After selecting the primary weapons for your team (extra gear can be reviewed, but never modified) and an entry point, you head into the situation. Team AI will spread out and clear a room effectively. Within the mission, you always control the team leader of a five-man team. You cannot switch to other members, or take over a new one if you’re shot. You navigate with standard first person controls and select equipment with the function keys. There’s a delay as you switch gear, including bringing your weapon back up when done, so anyone picking locks or throwing flashbangs is vulnerable. You can lean left and right to a very limited degree, as well as use F9 to deploy a flexible “mirror” (basically a camera on a stick) allowing you to safely see around corners. You also have the ability to call up picture-in-picture views from your teammates’ helmet cameras, to track their progress from a distance. Commands are given dynamically through a branching menu controlled with the number keys. Your four teammates can be ordered as a complete element, or broken into two-man red and blue teams. Placing the cursor on various objects (doors, hallways, hostages, etc) changes the context of your available orders. It’s a surprisingly elegant system, and exceptionally easy to point at a door, order your team to “breach, bang, and clear” and step back for them to execute the maneuver. 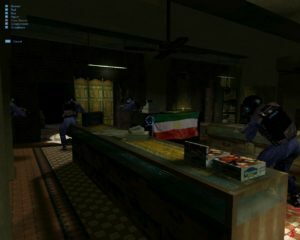 Once you get an order rolling, they’re quite adept at clearing rooms, securing hostages, returning fire, and doing whatever needs doing. This allows you to handily give red and blue teams different orders (clearing different small rooms, for example), and for the most part, your teammates are a joy to work with. Equipment includes breaching charges for locked doors, a multitool to pick locks and disarm bombs, and handcuffs to restrain civilians and suspects. You have two flavors of grenades. Flashbangs disorient suspects who might be waiting for your team to enter a room, and make walking through a door a bit safer. CS grenades flood the room with invisible tear gas for about a minute, “stunning” hostage and suspect alike with coughing fits. Finally, there are four weapons to choose from, covering machine guns, shotguns, and military rifles. You can further switch ammo types to penetrate armor and shoot through most walls (though enemies can do the same!). This ends up being an illusion of selection though – the late half of the game has you facing armored, organized terror groups, which all but forces you into using the assault rifle over all else. AI always has faster reactions and better aim than you do. The major difference between SWAT and Tom Clancy’s similar titles is in your very strict rules of engagement. Which is to say, you have to give every suspect a chance to surrender. Just because they’re holding a gun isn’t enough to kill them; you’re only allowed to return fire. At the same time, you naturally can’t shoot hostages, and need to do everything in your power to prevent them from getting killed. Your AI team has exceptional reflexes and an immediate grasp of when lethal force is allowed, further encouraging you to rely on them heavily to clear rooms (not to mention, the mission’s over if you get shot, but your teammates are comparatively expendable). Surrender is governed by an invisible morale limit. Logical things wear down this morale – you can shout with the 7 key, stun people with gas grenades, and seeing all five officers pointing guns is more threatening that just seeing you alone. Once someone drops to their knees with hands raised, you must secure them with handcuffs (suspect and hostage alike). Fail to do this, and they will eventually try to flee or go for a weapon. You’re also asked to secure dropped guns with the “use” key, and are required to report when hostages or wounded suspects can be evacuated. This is done with the 4 key on the command menu, triggering invisible “trailer” teams to collect them when you’ve moved out of sight. Missions don’t end until you properly report as well, and missed goals can be tracked with the B key. It certainly feels authentic while remaining accessible, and the locations and situations set it apart from similar games. You’ll raid shops and offices, storm an LAX airport tower, run protection detail in the Convention Center, and spend a lot of missions in various fancy hotels. Your initial engagements with only two or three people soon give way to chaotic situations with twenty or more, alongside plenty of unexpected extra attackers or hostages. The placement of all people and mission goals changes every time a mission is loaded (but numbers are fixed and determined by difficulty level), forcing you to rely on your tools and tactics with every engagement. Suspects that give up must be secured, or they’ll run and potentially cause a mission failure. However, there’s a real lack of consequence to many of these missions. Rare missions put invisible time limits on your activities, but these are always generous. Otherwise, I’ve never had a suspect intentionally kill a hostage or felt the need to “rush” through these levels. You can switch between stealthy and “loud” engagement modes, but alerting enemies to your presence with flashbangs and gunfire never puts lives at risk. With the exception of a few (hostage and terrorist alike) who will open doors and try to escape, most characters simply wait in place for you to come and find them. There’s also no consideration to any political or logistical angles. Your team seems to have an unlimited supply of flashbangs, so there’s no reason not to toss them into every room. You’ll never see a property damage bill or complaint. There’s no penalty to endangering civilians, so long as they don’t die. I’ve thrown flashbangs that landed next to the head of a four year old girl (surely resulting in permanent hearing loss). I’ve thrown tear gas that landed at the knees of the handcuffed mayor, who was forced to kneel there, coughing and sputtering, until the canister ran out. 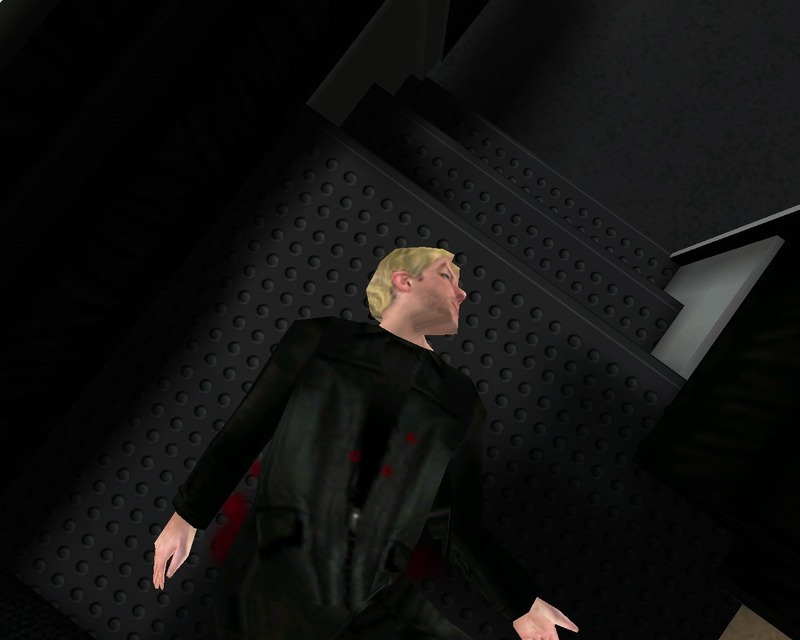 I’ve accidentally shot a Russian diplomat in the arm. None of these had any impact at all on my career. Instead, some of this is tracked in the permanent stats for your officer. Here you’ll see percentages for how often you died, proper use of force, leadership ratings, and more, alongside the usual tally of rounds fired and perps killed. It’s all presented without commentary, and my suspicion is that you’re meant to use this to track personal goals within your career. I can certainly see some players self-imposing stricter limits than the game does, and I suppose it fits with the “quasi-training simulator” feel of the game overall. If you don’t care about such things though, it’s fairly easy to shoot every enemy you see and even leave your team behind at lower difficulties. Mirrors function, and actually can be useful to spot hiding suspects. There are other smaller issues as well. You cannot move civilians once they’re cuffed, leading to the rare situation where they’re caught in a crossfire. Your “less-than-lethal” options are surprisingly limited, and you cannot physically force an uncooperative suspect or civilian to the floor – you can only yell and point your gun until they comply, which may be authentic procedure but is certainly frustrating. Missions won’t end until you find critical persons or gear, and there’s no way to send your team to autonomously search the level. Cue 30 minutes of searching and re-searching for last gun, the hiding hostage, or all seven bombs in the damnable sewer level. AI is generally smart, but not perfect – they’ll biff a few grenade tosses off the doorway, and frequently position in such a way that leaves the guy with the flashbang standing directly in front of the opening door (to get shot). I’ve had all four get killed trying to position themselves around an open doorway, making no effort to stop and take cover from the enemy firing on the other side. There’s also no “hold” commands, so timing red and blue teams to enter from two different sides of a room is virtually impossible. Graphics do the job, but little more. Allegedly, this is a version of the engine used for Gabriel Knight 3, though it works well as an FPS. Heavily compressed textures are the biggest flaw, with obvious banding and large low-res speckles. A significant amount of memory seems set aside to accurately mark bullet holes – including hits on suspects – allowing you to review your work after an engagement. Sound is similarly authentic. Voices are cast well, and your AI team is excellent at reporting their own status. The only real complaint here is that the radio gets crowded during the later missions, with your team’s reports stacked on top of your own required updates to command and their subsequent acknowledgements – for every hostage or wounded suspect. Overall, SWAT’s a good time. It strikes a good balance between being a fun game and featuring some considerations for the tactical simulation crowd. Engagements are varied, your AI is competent, and ordering them around with the menu system is far more enjoyable than Rainbow Six’s pre-planned waypoints. The obvious multiplayer mode doesn’t get added until later, though, and your AI teammates certainly don’t perform flawlessly enough to leave your career stats in their hands. A more accessible tactical shooter, and the best SWAT game to date. Trying to keep even the bad guys alive adds more interesting wrinkles than a military-focused shooter like Ghost Recon. AI is functional, and generally does their job well enough that it’s unexpected and disappointing when they break. A few missions require a lot of wandering and searching. Many engagements feel like they come down to luck, or hoping you don’t pull an unfair random enemy placement. Limited “less than lethal” options lead to a lot of seemingly avoidable suspect deaths. A squad-based tactical shooter is my idea of hell, but you actually make this one sound quite accessible. If I hadn’t been burned so many times before with games that I thought I could play but failed miserably at, I’d give this a go. Plus, SWAT 4 is meant to be good, too, no? It’s accessible, though if it’s not something that interests you, why force it? What I do remember of SWAT 4 is that it looked much better, but they changed the commands interface to be mouse-driven. I don’t remember if you could change it to SWAT 3 keyboard style, but I do remember some frustration. I also remember something about adding a new focus on bringing suspects in alive. SWAT 3 was pretty lenient about dropping guys that refused to surrender. SWAT 4 (and I could be wrong) I think didn’t give you a perfect mission score if you killed anyone, justified or not. I just remember giving everyone on the team beanbag shotguns and tear gas paintballs. I like the idea of these games, but am just too incompetent usually to make much progress. I’d probably just panic and shoot everyone and get a severe ticking off. I do like a good ‘amusing bollocking’ sequence though.